Has it really been seven years since I finally managed to track down a DVD copy of Wheels on Meals, just as Cine Asia (born from the ashes of Hong Kong Legends) was itself going out of business? That two disc release was itself a re-release of an earlier, 2006 release. When I finally reviewed it, I had found that time hadn’t been kind to what was once my favourite Jackie Chan movie. 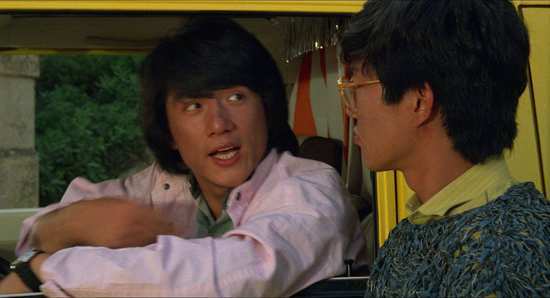 Fans have a special place in their hearts for those films where Jackie Chan, Sammo Hung, and Yuen Biao worked together, but when it comes down to it, the Lucky Stars films are somewhat juvenile comedies, only Project A stands up to the test of time, and this, Wheels on Meals falls somewhere in-between. At least it did back in 2012. There’s nothing like a Blu-ray to give me reason to re-evaluate an opinion, and thanks to Eureka Entertainment, Wheels on Meals now gets the HD treatment. David (Yuen Biao) and Thomas (Jackie Chan) are kung fu caterers in Barcelona. The kung fu is just incidental, and a result of their daily training regimen. Their real job is running a catering van in the city, a mobile restaurant for the locals and tourists alike. 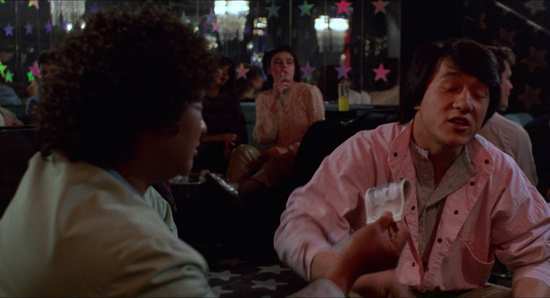 Admittedly the martial arts skills come in useful when dealing with passing Hells Angels gangs and the like, but they aren’t really tested until they encounter an attractive pickpocket named Sylvia. Wheels on Meals gets a 1.85:1 widescreen 1080p transfer that certainly impresses. The image is clear and sharp, detail levels are good, and the transfer is properly filmic, with a nice level of grain. One thing that I did sense was that the colours are more naturalistic than the old DVD, those eighties fashions look nowhere near as garish as before. Eureka goes to town with the audio options, offering the PCM 1.0 mono Cantonese track that I chose for authenticity, as well as a DTS-HD MA 5.1 Surround remix of the same. You have the same options for the original English dub, as well as another DTS-HD MA 5.1 Surround track with a newer 2006 English dub. Of most interest is the PCM 2.0 Cantonese track, which has the original dialogue, but mixed with the music soundtrack from the first English dub, which offers a funkier experience of the film. The English subtitles are accurately timed and free of typos, and I suspect that they are from a new translation. The first run release of the film will come with an o-card slipcover and a booklet, but I only got the check disc to look at, which boots without hesitation to a static menu. Most of the extras are lifted from that HKL/Cine Asia 2-disc release. The Brett Ratner interview has been dropped, which anyone with sense will be grateful for, but you might want to hold onto the DVDs if you’re a fan of Bey Logan audio commentaries. On Giant’s Shoulders: An Interview with Sammo Hung (7:41). Born to Fight: An Interview with Yen Biao (14:57). Jet Fighter: An Interview with Benny “The Jet” Urquidez (28:24). King of the Ring: An Interview with Keith Vitali (33:23). The Inside Track: An Interview with Stanley Tong (34:44). New to this release is the Archival Interview with Sammo Hung (10:05). You get Outtakes in the form of Spartan X – Japanese Release Credits (3:25), and Outtake Footage (4:01), and finally there are three trailers for the film. There are some films that are diminished by repeat viewing, where each subsequent re-watch lowers it in one’s estimation. When I first saw Wheels on Meals as a teenager, it was the best thing ever. It had comedy, action, entertainment and with a cool yellow van. It was like the Hong Kong Only Fools and Horses! I taped it from a late night Channel 4 Jackie Chan season, and nursed that tape for several years and even more watches. Back then, it was the best ever Jackie Chan movie for me, beating out Police Story, Armour of God, and even Project A. Now, not so much. Still, watching it on Blu-ray was a whole lot more enjoyable than that creaky old DVD that had me drifting off to sleep. The HD presentation, the quality of the image, the clarity of the audio once again had me feeling like I was watching a film for the first time, despite the fact that I know Wheels on Meals like the back of my hand at this point. The thing of it is that I’ve seen Wheels on Meals enough to think past the astounding action and slapstick humour, and try and analyse the film, and it really doesn’t hang together all that well. 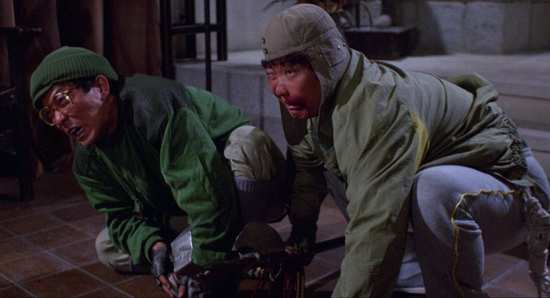 Like a lot of kung fu comedies of the era, it’s really just a collection of gags and action set pieces loosely hanging together by a couple of frayed plot threads, and if you even pick at one of those, it all falls apart. 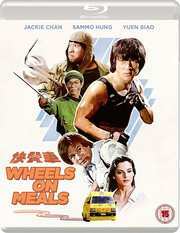 Where Wheels on Meals is beginning to lose its ‘best kung fu movie ever’ charm for me is in its comedy. 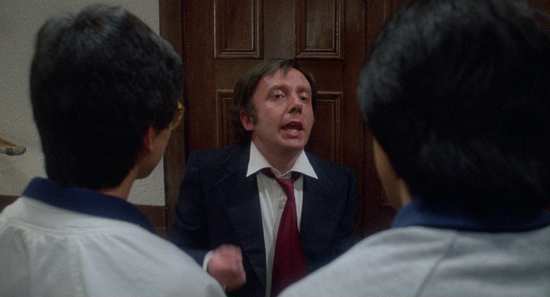 Not the physical comedy, which is just as inspired as ever, but rather the verbal and wordplay, the quick-fire gags and puns which mostly come from Sammo Hung’s character Moby. What I used to think of as witty and humorous now appears forced and juvenile. I suppose that says more about me as a viewer than it does about the film. 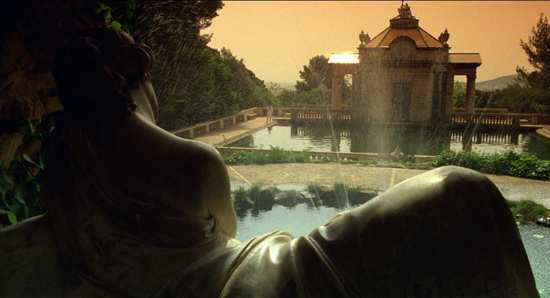 But it’s this which breaks my span of attention, and gets me thinking about the film and its gossamer plot. But plot is not what Wheels on Meals is about. The sight gags still work, the physical comedy is amazing, and it’s the action sequences that really stand out in this film, and here you have the trio, the brothers in their prime, Jackie Chan, Yuen Biao, and Sammo Hung. They deliver action here like you would not believe, and with hardly a stuntman and not a single special effect in use. 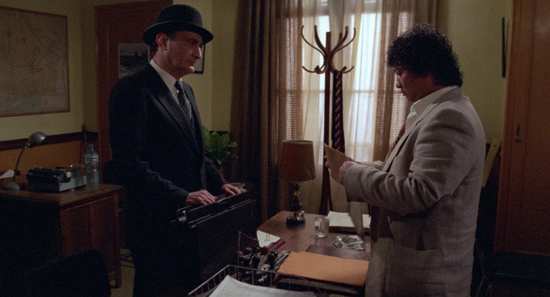 What makes it all work is that the challenge that they face is so good, as Benny ‘The Jet’ Urquidez and Keith Vitali provide antagonists that you can believe would give our heroes pause. 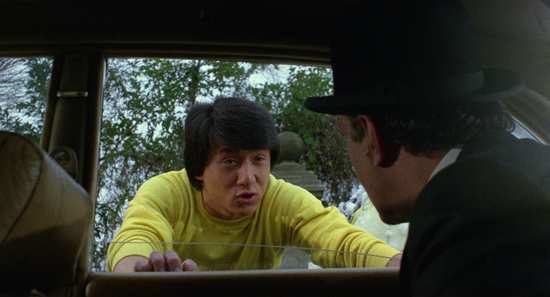 It’s no wonder that when asked about favourite kung fu action scenes, a lot of fans will cite the Jackie Chan and Benny Urquidez fight at the end of this film as one of the best ever put to celluloid. For me, Wheels on Meals is no longer the best martial arts action comedy any more, but that’s probably because I’ve just seen it so many times. 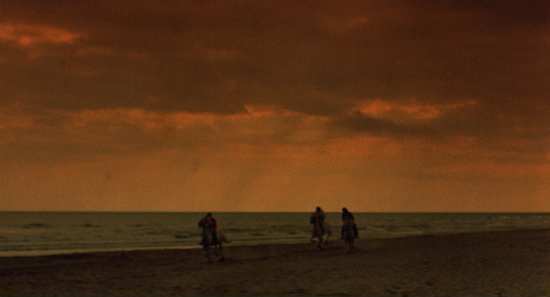 It is still one of the best though, and seeing it on Blu-ray brings a warm feeling to my heart, that sense that all of my favourite films will one day make it to high definition. I’ll keep a little slot ready for Titan A.E.